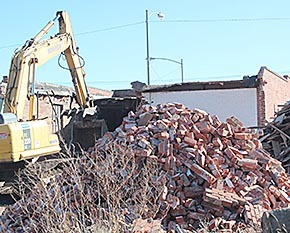 Demolition began Friday, Feb. 13, at the former Albion Bike Shop building on East Main Street. By Saturday afternoon, the building had been reduced to rubble and was being hauled away by Bygland Dirt Contracting, Inc. 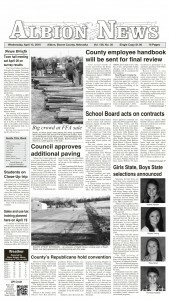 The former Billy Bob’s building next door is also scheduled for removal. History of the Bike Shop building in this week’s Albion News Print and E-Editions.